Born in Tokyo, Japan, Tomoko began her piano studies at age 5, and performed in public at age 7. She fell in love with the sound of the piano at a young age and it hasn’t changed! Tomoko came to the United States at age 10, and continued her studies, performing and competing at regional, national and International competitions. She won 1st place with her sister Yuki in Tokyo International duo competition, and a special “Kodama” prize from the founder of the competition. She was also a top prize winner with her sister in the Dranoff International duo competition in Miami, Florida. She has recorded four acclaimed CDs with her sister. Her recordings are available on CD Baby and also through her website. 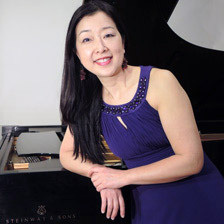 Tomoko is an active performer, teacher, and she is also frequently invited to adjudicate at major piano competitions in the U.S.A. and Japan. Every summer she travels to Poland to teach, perform and co-direct with her husband, pianist Kazimierz Brzozowski the International Piano Festival in Nałęczów. They spend two summer months in their second home in a quaint old town of Kazimierz Dolny enjoying family life and preparing new repertoire. Winner of MMTA state collegiate level, soloist with the Grand Rapids symphony, Livonia Symphony, Warren Symphony, Pontiac Oakland Symphony, Detroit Civic Orchestra, and many others. She has played for Aspen Music festival, International chamber Institute un Munchen, master classes with Andre Watts, Menahem Pressler, Gabriel Chodos, Seymour Bernstein and other world renown pianists. She is a co-founder and an artistic director for Poland International Music Festival which is held each July in Naleczow, Poland. Selected as top piano teacher of 2017 by Steinway & Sons. Mack Sisters selected as artists of the year by Tuesday Musicale in 2017. School Concerts & Family Concerts, Lectures, Demonstrations, Interactive work with the audience.